If you’ve ever stood on the side of a road and seen a car about to crash you’ll understand this film. If you’ve ever sat in a car that is likely to crash you’ll understand what is staring the characters in the face in Margin Call. 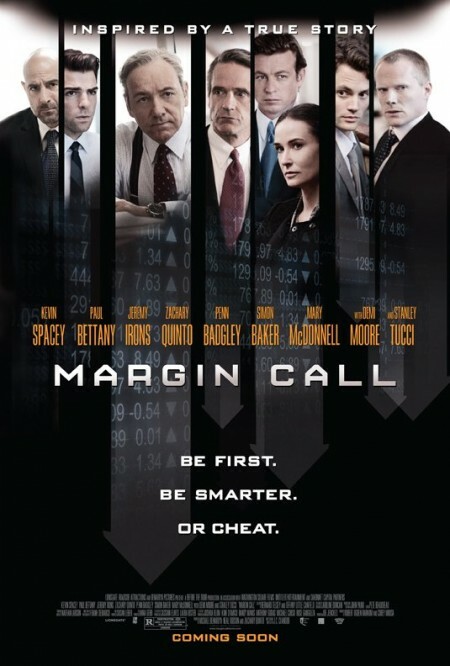 Margin Call is the story of 48 hours in a bank as things go wrong. Almost from the start there is a growing sense that things are falling apart. It starts in a small way and grows as the crash looms more and more certain. This is a story that could become bogged down in the detail of the financial dealings at the core of the story. Instead it sketches them in the same way a science fiction film uses techno babble to explain how a space ship travels faster than light and don’t fall out of the sky despite having no wings. There seems to have been a Mexican standoff amongst the actors. There are lots of actors in this who are known for chewing scenery including Kevin Spacey, Paul Bettany, Jeremy Irons, Zachary Quinto and Stanley Tucci. Yet the performances are measured without histrionics. The drama is on the screen but it’s the car crash that’s about to happen. This is a smart film with no gun fire, chases, explosions, fist fights or car crashes except a metaphorical one. If you want to see an interesting film go see this.